The best thing about planning a family vacation to Hawaii is that it doesn't matter when you go - the islands are warm and sunny year-round. Family vacationers flock to Hawaii in the winter, spring and summer. Many hotels offer packages such as reduced rates when booking two rooms for a few days in a row. If you want to avoid crowds and your travel dates are flexible, hotels are usually the emptiest from the end of September to just before Thanksgiving, as well as in May. During the busy times of the year, be sure to book your room, airfare and activities well ahead of time to get what you are looking for. Mauna Kea Beach Hotel on the Kohala Coast of the Big Island of Hawaii is set on one of the best beaches in the world, complete with white sand, palm trees and clear blue water. Guests enjoy a variety of water sports on their trip. After playing in the sun, indulge in a massage at the resort's Spa and Fitness Center or relax by the pool. Play tennis at the oceanside Tennis Park which features 13 Plexipave courts and a video training facility. If you want to tour Hawaii by air, there are a number of helicopter tours to choose from and a helipad located on the property. Other activities include hiking, jogging and stargazing at the sister property, the Hapuna Hotel. The resort has two great golf courses, the Hapuna Golf Course and Mauna Kea Golf Course, a 18-hole championship course with incredible panoramic views of snow-capped mountain, black lava beds and the ocean. Facilities include a driving range, PGA Instruction Program, Pro Shop and rental equipment. There is a year-round programs for children ages 5 to 12, including arts and crafts, pole fishing, T-shirt painting, swimming and treasure hunts. Guest rooms and ten suites have a private balcony and natural wood interiors. The resort's signature restaurant is the Batik which features cuisine with classic European, Pacific Rim and East Asian influences. Other dinning options include the Pavilion, overlooking the Kauna'oa Bay, the Terrace with a chilled seafood bar, the beachside Hau Tree/Gazebo and the 19th Hole at the Clubhouse. On Saturday nights, join the Clambake at Kauna'oa Bay, enjoying a wide selection of seafood, meat and deserts. The Kohala Resort Shuttle Service is available for free transportation between the two hotels. For a nominal fee, the shuttle also runs to the Waikoloa Resorts, King's Shops, Waimea Town and Parker Ranch Visitor Center. The best way to explore the Big Island is by car. When making a reservation at one of the hotels, ask for a package that includes a car rental. The hotel is about 45 minutes from the Kona International Airport by car. Room rates start from US $375 (800-882-6060, 808-882-7222. 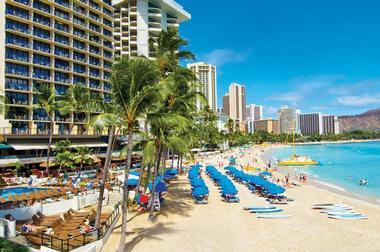 The newly renovated Outrigger Waikiki Beach Resort is located right on Waikiki Beach. Guests can choose from numerous watersports and other activities, including surfing, canoeing and shopping. Oceanfront rooms and suites feature new glass-bordered balconies, perfect for watching a sunset over the Pacific. The resort has a swimming pool just steps from the beach and Waikiki Plantation Spa which offers a variety of Hawaiian and international treatments. Families can participate in a range of complimentary Hawaiian cultural activities, including hula and ukulele lessons, lei making, Hawaiian music and vow renewals. The hotel's interior decor reflects the historical and cultural roots of the area. The lobby showcases historic artifacts, including a beautiful koa canoe and wall murals. The hotel offers 497 guest rooms and 30 suites. 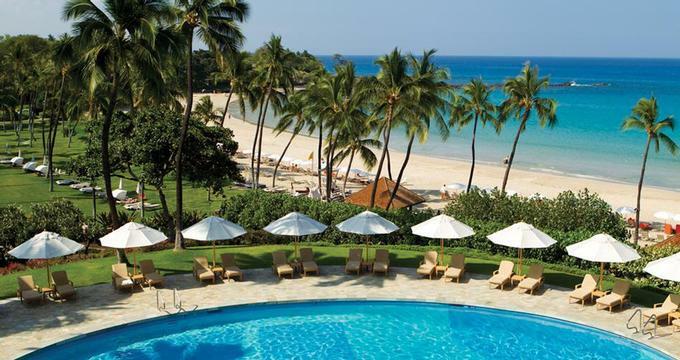 The Kaanapali Beach Hotel is a tropical getaway on Maui, Hawaii. There is so much to do at the resort that you may need to visit the Ohana Fun Center to sort out your activities. The Fun Center holds a free Ohana Welcome Breakfast Monday through Saturday for new hotel guests. There are 430 guestrooms and suites. The hotel is divided into four separate wings: the Maui, the Lanai, the Kauai, and the Molokai. Room categories are based on view type, from garden view, partial ocean view, ocean view to ocean front. All of the rooms have terraces with nice views but the ocean front rooms are the best, situated just yards from the sand, and let you fully take in the tropical island ambiance. The numerous dining choices are all designed to give guests a true Hawaiian dining experience. Dining options include the Tiki Terrace Restaurant, the all-you-can-eat buffet at the Kaanapali Mixed Plate Restaurant, and the Tiki Grill & Bar. Visit the historic town of Lahaina for shopping, dining and museums. The resort is a 45-minute drive from Kahului Airport and a short ten minute ride from the Kapalua West Maui Airport. The Kapalua airport is closer, so if you're not that interested in the drive, try to fly into the Kapalua West Maui Airport. Ask for the Island Romance offer which includes: car rental, buffet breakfast, picnic lunch, 25-minute massage, choice of an activity such as dinner cruise or luau, and a dinner. The Island Romance Package (Based on double occupancy) lets you save over $547. 5-Night Package Price is $2,039. Rates range from $175 to $600 per night. There are also some good packages offered by the hotel so be sure to check online for the most recent special offers (800-262-8450, 808-661-0011, kbhmaui.com). 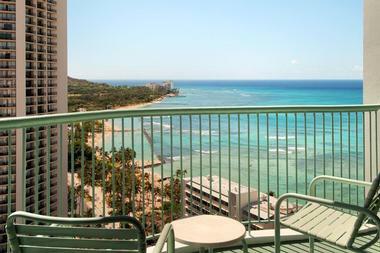 Sheraton Princess Kaiulani is an affordable option in Waikiki. 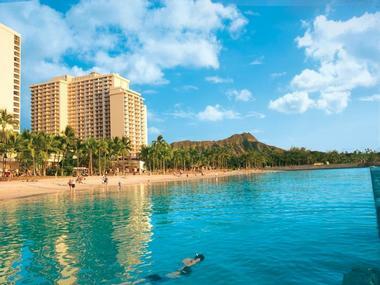 The hotel is located near Kapiolani Park, the Honolulu Zoo and Waikiki Aquarium. It features a freshwater swimming pool, nightly poolside entertainment and a Polynesian dinner show, a fun event to attend with the whole family. The area offers a variety of activities, including surfing, swimming and canoeing. The hotel has 1,150 rooms, some with ocean views. There are 10 suites. There are two restaurants and a food court. At night, head to the pool for poolside entertainment at the lava rock stage. The Momoyama restaurant serves Japanese cuisine (808-922-5811, 866-500-8313, princess-kaiulani.com). Any child that has been to Aulani, the beautiful Disney Resort & Spa in Hawaii, won't be able to talk fast enough to describe all their favorite attractions at the resort. From Aunty's "Once Upon an Island" Storytelling to the Olelo Room where kids can learn about the Hawaiian culture, the programs at Aulani are both fun and educational. And best of all, while kids are busy with activities, you can treat yourself to a massage at the spa or a round of golf. Aulani is located in Ko Olina on the western side of Oahu, fronting a white-sand beaches and the Pacific Ocean. Take the whole family Tubing on Waikolohe Stream. The current is gentle enough for younger children or those who prefer to be more cautious. Look through the underwater window at the Rainbow Reef. Even if your kids are too young to snorkel, they can watch the fish and learn about the underwater life. Sign up for the Catamaran Experience with Aulani Excursions and explore the ocean with an experienced guide. Head to Aunty's Beach House for Aunty's "Once Upon an Island" Storytelling. Learn about taro farming hands-on at Aulani's taro patch. Here is a view of the taro patch at night. Enjoy a sunset dinner with the whole family on the outdoor terrace at Ama'ama Beach Restaurant. Older kids and parents can take surfing lessons at the Hawaiian Fire Surf School. Head to The Olelo Room to learn about the Hawaiian culture. Kids can pick up Hawaiian words and learn about the island's diverse history. Book a family suite or a double room with a terrace so that you can relax outside with a view. The Menhue Bridge offers climbing and water play for kids of all ages. Go snorkeling in the Rainbow Reef which is home to Hawaiian fish and other marine life. Last but not least, the white-sand beach at Aulani is a fun place to kick back and relax surrounded by sand and water. 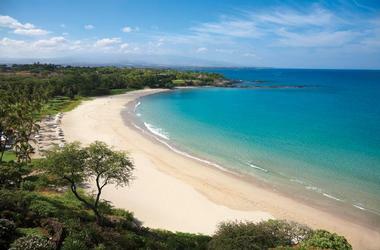 VacationIdea.com Tip: Be sure to look for specials to save on your family trip to Hawaii. If you are looking for an affordable place to stay, Aston Waikiki Beach Hotel is located across the street from Waikiki Beach. Many guest rooms offer partial or full ocean views. You will be close to restaurants, shopping and attractions, such as the zoo and aquarium, fun places to visit with kids. The hotel has 645 rooms decorated in tropical colors and a heated outdoor pool where you can relax in the sun. Guests receive access to the fitness center, making it easy to stay in shape while you travel. Kids can have fun with the in-room video games. Ask for a room with a private balcony so that you can enjoy the views and ocean breezes. Accommodations include a mini-refrigerator for your drinks and snacks, 32-inch flat-screen cable TV and daily maid service. Aston Select Rooms are Oceanfront and Ocean View with a private lanai - ask for one facing the sunset. Families can request a baby crib and children are welcome in the hotel restaurants. There is an outdoor swimming pool, concierge desk, cocktail lounge and several shops. Tiki's Grill & Bar is located on the second floor. This open-air restaurant features a retro South Pacific design and an open exhibition kitchen. Reserve an outdoor table and watch a colorful sunset. Enjoy complimentary signature "Breakfast on the Beach" every morning, complete with live Hawaiian music and a hula dancer. The property offers a wedding package includes: 4-nights, wedding ceremony & reception, wine, chocolate, rose petals. Guests who get married at the hotel can spend their honeymoon in Lake Tahoe or Lake Las Vegas for free (you will receive a complimentary 3-night stay). >The property offers several meeting rooms, including the Lokahi Meeting Room on the upper lobby level for up to 60 people. The Coconut Club on the hotel’s 21st floor offers scenic ocean views and is a favorite for cocktail parties and sunset receptions. The Coconut Club can accommodate up to 120 people. Catering and wedding coordinators are available on site. Rooms start at $141 per night, making this an affordable option in the area. There is free WiFi service in the upper lobby (but you have to pay for internet in the rooms). Children receive a free Coloring Book at Check-in. Valet parking costs extra (800-877-7666, 877-997-6667). A family trip to Oahu can mean a stay at a large resort in the heart of Waikiki Beach, or a more intimate getaway on other parts of the island. In Waikiki, Hilton Hawaiian Village and the Sheraton Waikiki both offer a children's program for children ages 5 to 12. While kids learn about Hawaii and play games, parents can go shopping, take a surfing lesson and have drinks with a view. The Kahala Hotel, a 10-minute drive from Waikiki, has a private sandy beach and a man-made dolphin lagoon which is sure to excite kids. The hotel offers family vacationers luxurious rooms, a pool and secluded beach, several restaurants, spa suites, a dolphin lagoon and a kid's club. The rooms are furnished in traditional Hawaiian style with a modern twist and have great views. You can choose to camp the family out by the pool or on the 800-foot-long beach. The 26,000 square foot natural lagoon is home to six Atlantic Bottlenose dolphins. Kids ages 5 to 12 can take part in the Quest, a two hour program to that will educate them about dolphins as well as allow them to see them in shallow-water. The Keiki Club activities include: lei making, reef walking, bamboo pole fishing, snorkeling, and hula dancing. Rates start at $325 per night. On the North Shore of Oahu, Turtle Bay Resort offers villas just steps from its ocean. These luxury villas are well suited for families that like to barbeque and relax together in a private space. Choose from an array of vacation activities in natural surroundings. The Ocean Villas, located steps from a white sandy beach, offer families the flexibility of preparing their own meals while on vacation. The luxury villas have a Jacuzzi, courtyard and a barbeque area. And when you don't feel like cooking, a private chef can be hired for groups of two or more. The Ocean Villas at Turtle Bay Resort come in studio, 3-bedroom and 4-bedroom configurations. The villas include a private lanai, a living area, a dining area, and a fully equipped kitchen with granite counter tops, dishwasher and small kitchen appliances. Ask for one of the villas on the ground level for the easiest access to the beach. One-bedroom luxury villa rates start at $868 per night. The island of Maui is a popular with families, and recognizing that interest airlines offer many direct flights to Maui from the mainland. There are several upscale resort areas on Maui where guests can choose from an array of vacation activities such as snorkeling, golf and spas. Kapalua Resort on West Maui has three beaches and several different accommodation options. If you like to prepare some of your own meals and need the convenience of a washer/dryer while on family vacation, rent a condo at the resort. Guests who prefer to stay in a hotel can try the Ritz-Carlton, Kapalua. Another popular family destination on West Maui is Kaanapali Resort which has condos, programs for kids and three miles of sandy beaches. 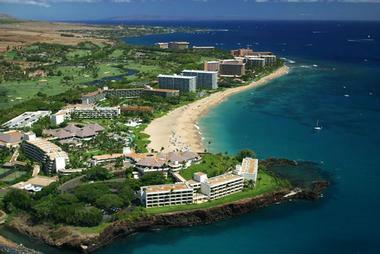 The Fairmont Kea Lani Maui on the southern side of the island has a spa, golf, and spacious suites for families. Mauna Lani Bay Hotel on the Big Island of Hawaii offers luxury accommodations and a selection of activities for the whole family. Vacationers can relax in a hammock, play sand volleyball or try a few rounds of scenic golf on the resort's two golf courses. Kids ages five through 12 can sign up for the Mauna Lani day camp. Available year-round, camp activities include visits to tidal pools, historic fishponds and petroglyphs, learning Hawaiian and games. Rates for Camp Mauna Lani start at $50 per day. There is a Beach Crew which assists with activities, hammocks, lounges and cabanas. For grown-ups, the resort offers fitness workouts and morning walks. While the kids are at camp, parents can relax at the resort's unique health spa, complete with outdoor treatment huts and a lava sauna. Room rates start at $430 per night, but families can usually get a lower rate when booking two rooms for three nights or longer. Find more great resorts with kids' programs. Located on an archipelago in the Central Pacific Ocean, Hawaii became part of the United States in 1959, making it the only state that is wholly composed of islands. Its volcanic history has given the islands a peculiar scenery of rugged landscapes, cliffs, valleys and waterfalls, while its location is naturally endowed with golden, white, black and red colored beaches, and green tropical forests. Hawaii does not observe daylight savings time, making it an even greater mystery that most visitors look forward to experiencing. Below are 25 of the best places one should visit in Hawaii. Maui is a Hawaiian island that is commonly known as the ‘Valley Isle.’ Whales migrate from the coast of Lahaina and are visible at the Maui coastline, making it a famous spot for whale watching in the winter. Watch waterfalls as you drive through adventurous and beautiful Hana Highway with its numerous curves and bridges. Haleakala National Park gives you the advantage of watching the golden sunrise from 9,740 feet high at the top of Mt Haleakala Crater. The island has both a leeward side and windward side, meaning visitors get to experience both climates. Due to these trade winds, the east side of the island has more lush greenery, while the west side has a drier climate. This is the largest of the Hawaiian Islands, otherwise known as ‘The Big Island.’ It has an active volcano in Kilauea, which provides a spectacular volcanic view, not to mention the magnificent sight of the snow-capped Mauna Kea Mountains. The Big Island has numerous captivating features such as being the birthplace of King Kamehameha, and hosting the first missionary church in Kailua Village. Its Panaluu Beach is covered with black sand, in which guests and locals sunbathe, hike, and take in the evening breeze as they look out into the Pacific Ocean. Visit Volcanoes National Park during the day and walk the Thurston Lava Tube, or go at night for a chance to view lava in the dark. Oahu is also referred to as ‘The Gathering Place,’ being home to all Hawaiian cultures, as well as the capital, Honolulu. Take a step back in history and visit the Pearl Harbor Memorial, five historic sites that commemorate the 1941 attack on Pearl Harbor. In the winter, the North Shore is packed with surfers looking for the next big wave. Guests will enjoy the architecture of Iolani Palace, which is the home of the last two reigning Hawaiian monarchs. Waikiki, once a royal playground, has also become a popular place for tourists to visit. Take a hike on the Leahi Diamond Head hiking trail and enjoy the magnificent view of the Island’s beauty. Kauai Island is also referred to as the ‘Garden Isle.’ It has five popular destinations, including Princeville on the North Shore, Coconut Coast on the east, Kalapaki in Lihue, and Poipu to the south. The Napali coast is great for boat rides, while the native ponds close to the ocean provide a remarkable view. Visitors can also learn about the mysterious legends of the coast. The interior is lined with rainforests, rivers and waterfalls, while the cliffs and valleys are a perfect illustration of the Hawaiian environment. Waimea Canyon also triggers the excitement of guests with its panoramic views of the Island. Kokee State Park trails offer hiking opportunities for those looking for an adventure. Honolulu is the capital of Hawaii, bursting with government and business activities in Downtown Honolulu and Chinatown. The Honolulu Museum of Art has wonderful exhibits and informative tours, such as a guided tour of Shangri La, one of Hawaii's most architecturally significant homes. Honolulu has an air of royalty, hosting the Iolani Palace, the Queen Emma Summer Palace, and Washington Place, where Queen Liliuokalani resided. Also located in Honolulu is the National Memorial Cemetery of the Pacific at Punchbowl Crater, as well as the Waikiki Natatorium War Memorial. Find unique shops and delicious local food in the neighborhood of Kapahulu, or visit the historic Honolulu landmark Aloha Tower Marketplace to buy some gifts to commemorate your trip. The park is live evidence that primordial forces are still working. Hike, bike, and camp, or drive the “Chain of Craters Road” for a spectacular and scenic drive ending at Makaopuhi Crater. Many of the archeological sites in the area have been covered by lava over the years. Visit Jaggar Museum & Overlook to experience breathtaking views and cultural exhibits. Watch volcanic gases escape from the ground at Ha’akulamanu (Sulphur Banks). These gases are rich in carbon dioxide, sulfur dioxide and hydrogen sulfide, causing a rotten egg smell. When you’re in the mood to relax a little, head over to the Kilauea Visitor Center to watch the feature film Born of Fire, Born of the Sea. No matter what you decide to do, a day at Hawaii Volcanoes National Park is sure to create the best memories. Hilo provides you with beautiful sites of fertile rainforests and striking gardens. It is also the gateway to Hawaii Volcanoes National Park, where your adventure will be extended. Hilo is home to several museums, which include the Imiloa Astronomy Center, the Lyman Museum, and the Pacific Tsunami Museum, all of which are full of varying Hawaiian history. Imiloa Astronomy Center has three titanium cones over it, which represent the three largest mountains in Hawaii. Hike through a Koa (hardwood) forest, and do not forget to visit Boiling Pots & Rainbow Falls in Wailuku State Park. Be sure to visit the Liliuokalani Gardens, a 30-acre Japanese Garden with beautiful views of Hilo Bay and Coconut Island. Molokai, also known as ‘The Friendly Island,’ was created through volcanic action in the middle of the Pacific. It has beautiful beaches on all ends, and while not all are easily accessible, they all provide fantastic scenery. Take a trip to Kapuaiwa Coconut Grove, one of the few remaining royal coconut groves in Hawaii. From December to April, look out for Humpback whales who migrate to Molokai from Alaska to mate. Also to be spotted are Spinner Dolphins and Green Sea Turtles. Be sure to visit Kalaupapa, a former leprosy colony that is shaped like a shark. Located a block from downtown Kaunakakai, the Molokai War Memorial is a marble monument which bears the names of residents who lost their lives fighting for America. Lanai is a beautiful mix of classic beach resorts with sophisticated architecture, expensive food and golf courses, and rugged roads and beautiful gardens such as Keahiakawelo, which is also known as the Garden of the Gods. Polihua Beach is the most secluded beach in Lanai, and is the best place to see Hawaii’s green sea turtles, though guests are advised not to disturb them. Hike, bike or stroll through the rustic Munro Trail, and get spectacular views of ironwood, eucalyptus, and pine trees. Hulopoe Bay is a beautiful place to relax, with its white sand, crystal blue water and elegant views of the ocean. Kailua is a quaint beach town located just 30 minutes from downtown Honolulu. It is home to Kawai Nui Marsh, the largest remaining wetlands in Hawaii. Kawai Nui is the largest fresh water pond in the Hawaiian Islands, and is home to endangered water birds such as the Lysan Duck, and the Hawaiian Goose. The marsh is complemented by Hamakua Marsh, which is also home to endangered species of birds such as Stilt. Get a view of the historic Hilltop House, a home built around the rocks where it stands, with only some compatible stones added to secure the structure. Take the Lanikai Pillboxes Hike, a short trail featuring WWII Pillboxes (bunkers) and panoramic views of Lanikai Beach. Make sure to also check out the historic Lanikai Marker, a stone and concrete monument built in 1924. Hana is on the eastern tip of Maui. Though only 52 miles from Kahului, Hana Highway provides numerous sights including narrow one-lane bridges, hairpin turns, waterfalls, seascapes, and rainforest views. Located off of Hana Highway is Kanahu Gardens, a botanical garden and preserve which holds the world’s largest collection of breadfruit cultivars. Kanahu Gardens is one of five gardens included in Hawaii’s National Tropical Botanical Garden. Set above Hana Bay, Travaasa Hana is a tropical resort offering guests the chance to experience “Maui’s Last Truly Hawaiian Place”. Hana Beach Park and Hamoa Beach are beautiful beaches that provide sunbathing and swimming, while Waianapanapa State Park, with its beautiful black sand, is great for snorkeling. Before you leave, make sure to stop by Hasegawa’s General Store to pick up a memento from your trip. Waimea Canyon State Park is also known as ‘The Great Canyon of the Pacific,’ and lives up to its name. It provides lookout points and panoramic views of crested buttes, rugged crags, and adventurous valley gorges. The Canyon allows visitors to be mesmerized by the natural heritage of Hawaii, and makes them want to come back for another visit. Waimea Canyon Drive leads to the main Waimea Canyon Overlook, from which one can have a clear view of Kauai’s interior. Waimea Canyon State Park has a spacious parking lot, and bathroom facilities, making it the perfect place to spend the day. Haleakala National Park provides a perfect blend of ancient and modern Hawaiian culture. It is lined with tropical rainforests, volcanic landscapes, and a backcountry hiking area. It is also home to endangered animal and bird species, including the Hawaiian petrel, and Hawaiian Goose. The park experiences two climates, the dry leeward and the wet windward, which allows diversity in plants and animals. Guests are mesmerized by the view of the luminous Haleakala silversword plants, which live for ninety years but are only flowers once in their lifetime. While here, take the chance to enjoy the vastly different species of honeycreeper birds, protected by park manager from predators. The Oheo stream, with its cascading waterfalls, allows for clear viewing of native fish. Napali Coast State Wilderness Park is characterized by large cliffs and deep, narrow valleys. Tourists are attracted by a number of waterfalls that line and grace the valleys like some kind of flowing decoration. The valleys bottom is characterized by stone walled terraces, which are a clear indication that the valleys were once cultivated human settlements. The sea carves the cliffs and creates a lovely, magical sites that no tourist should miss. At the beginning of the park there are several amenities including restrooms, outdoor showers, trashcans, drinking water, and a pay phone. Visitors are free to camp, but need to obtain camping permits. Diamond Head State Monument provides panoramic views of the Pacific Ocean and Honolulu City. In fact, it was used by the United States military as a post to prevent attacks against Honolulu. The trail to the crater is on uneven and steep land, so only experienced hikers should take the trip. At Kulaniapia Falls, sit back and take in the 120 foot waterfall. Undertake some or all of the great activities at the monument, such as the Diamond Head Biking Tour, Diamond Head Segway Tour, Diamond Head Sunrise Run and Yoga Tour, and Diamond Head and Oahu Coast Half Day Tour. All of these tours will provide you with the adventure of a lifetime. The mountain peak is in a high alpine desert environment with little humidity, and there is no water on the trail, meaning hikers must bring their own to stay hydrated. The hiking trail is six miles, and should take the experienced hiker around eight hours to complete. The hike is on a high altitude and in a hypoxic environment, thus calling for hikers to be in peak physical condition. The Visitor Information Station has rangers and guides that can answer all of your questions about the summit. There are thirteen astronomical observation facilities that are multinational, due to the strategic point of the summit. The summit offers a free star gazing program, with telescopes provided, from 6:00am to 10:00pm at the Visitor Information Station. The Kilauea Iki Trail leads visitors to a solidified, but still steaming, lava lake. It was here in 1959 that the Kilauea Iki Crater erupted, with lava fountains reaching up to 1,900 feet high. The volcano had 17 explosive episodes over the span of two months. According to Hawaiian mythology, the Kilauea Halemaumau Crater served as the body of Pele, goddess of fire, lightning, wind, and volcanoes. She is also believed to be the reason people have a home on the island. The trail starts at Kilauea Iki Overlook on Crater Rim Drive, offering a trip rich with nature, beautiful flowers, and rocky ground. The hill on the opposite crater wall, known as Pu‘u Pua‘i (gushing hill), did not exist prior to the 1959 eruption. Hanauma Bay Nature Preserve provides a shuttle that picks up guests from the nearby Waikiki Hotels. Being on a hill top allows for breathtaking views of the Pacific Ocean and surrounding island. There are a wide range of activities at the preserve which include snorkeling, paddling, and kayaking, not to mention tour guides that take you through the entire bay, explaining and answering questions about the preserve and Hawaii in general. Banzai Pipeline Beach at the preserve offers a view of diverse fish species and other marine life. The popular Waimea Bay crowns your trip with a lovely view. Kalalau Trail connects Ke’e Beach to Kalalau Beach along the Napali coastline, all the way offering serene views of the Pacific Ocean. It is the only path leading to the rugged Kalalau Beach. The trail commands visitor’s full attention, as there are many streams along the way that need to be crossed. Those skilled at climbing should be sure to check out Crawlers Ledge, an uneven, narrow ledge against the cliff. Hikers go through five valleys and sea cliffs, waterfalls and green surroundings that make the trail very exciting. Camping is only safe at Hanakoa or Kalalau, so you have to be sure that you are at either end of the trail. Waianapanapa State Park has a scenic volcanic coastline that is characterized by black sand beaches, which, during calm weather, allows for swimming, fishing, and sunbathing. The state park is a home to sea birds, a legendary dark and deep cave, anchialine pools, natural stone arches, and the native Hana rainforest. Guests can undertake activities in this natural environment such as fishing at the ponds and the sea shore, as well as picnicking and hiking on the ancient rugged trail that leads to Hana. Guests who really want to maximize their time here can make a night of it while camping (permit required). Kailua Beach Park is close to nearby islands, making it the ideal place for visitors to adventure. The beach is popular for water sports such as surfing, body boarding, and kayaking, especially since individuals and groups from surrounding islands can easily make the trip here. The white sand and beautiful blue waters blend together making it the loveliest place to sit back and relax. Kalama Park on the west is a lesser known, less crowded park. With beautiful scenery, a grassy park, and a 180 degree view of Kailua Bay, it is the perfect, quiet place to lounge. The water lends itself to swimming, body boarding, and stand-up-paddling, but guests should be aware that there is no lifeguard on duty. Hapuna Beach Park has something for everyone, from swimmers and buskers to snorkelers and fishers, while body surfers enjoy the constant sea breaks. However, during the breaks, which sometimes go up to six feet high, only expert body surfers and rescuers should be within vicinity, since the water becomes risky. Hapuna Beach Park has a beach trail along the coastline that gives you a satisfactory ocean view. If guests work up a hunger, the Three Frogs Café is a snack bar serving burgers, fish tacos, and smoothies, as well as other small items. Hapuna Beach Park rents out 4-Person A-Frame Shelters, consisting of a screened room, a wooden sleeping are, and a picnic table.